August 29, 2018 "Information Clearing House" - Say what you want about how American administrations, from former president Harry S. Truman downward, have, over the years, treated Palestinians. But none was so actively engaged in gunning for them as the current one. Relations between the present-day administration — an administration that from day one has trumpeted itself as the custodian of a mythical “deal of the century” — and the Palestinian National Authority (PNA) took another nose-dive last Friday when leaders in Washington permanently cut more than $200 million (Dh735.6 million) in aid for the West Bank and Gaza, saying the appropriated funds will be “redirected” elsewhere, but didn’t say where the money would go. A State Department official, in another one of those typically obtuse statements this government agency is notorious for issuing with impressive ease, said the decision was made “after a review to ensure these funds were spent in accordance with US national interests”. 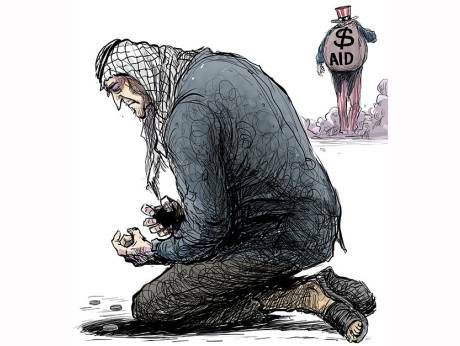 America’s cut of $200 million, along with the drastic cut in its contribution to the United Nations Relief and Works Agency (UNRWA) in January this year, is calculatedly pauperising Palestinians and bringing them to their knees. This is an effort to educate them out of the folly of their putative recalcitrance. Meanness? Gratuitous malice added to injury? Consider, in this regard, the Taylor Force Act, a legislative bill passed in the Senate in March this year, that proposed a termination of American economic aid to the PNA until the group ceased to pay welfare cheques to the families of those patriots who have fallen in the struggle against the occupation, and those political prisoners who have ticked off functionaries of that occupation with their activism. Never mind that the end result of this action is that families of breadwinners who are in graves or behind bars will now be rendered destitute. But let’s face it folks, we all know why Palestinians in the West Bank and Gaza have been pauperised and brought to their knees. Any person who does not see why, say after a brief visit to the Occupied Territories or after a cursory reading of the facts that define life there, will raise very serious doubts about the professional skills of his optometrist. You rob a Palestinian farmer or peasant of his land and you rob him not just of access to his traditional means of production, his ability to make a living, but you rob him of his honour as well. Yes, it’s encoded in the culture. In traditional culture, how you protect land, no less than how harvest its crops, defines your manliness — thus the Palestinian aphorism, used by those who have tilled the land since time immemorial, “ardi-a’ardi”, that is, “my land is my womenfolk”, interpreted liberally to mean that “my land represents my dignity as a man”, a man who must guard against its violation much in the manner that he guards against the violation of his womenfolk. Then water. Water, of course, is key to economic development and central to the realisation of human promise, expanding as it does the scope of a people’s ability to lead lives that they value. Among economists and other social scientists, water is always integrated in their studies of human development, with the objective of creating an environment in which people will be able to explore their potential and enjoy healthy, productive, long lives. In fact, it will not be an exaggeration to say that water is life itself. And it’s Palestinian water in Palestinian land we’re talking about here! The moral of the story? The Palestinians are destitute because Israeli occupiers, through larceny, have forced them into that condition. And Israel was able to beggar them because it had always had the backing of the US. The US is punishing Palestinians for the condition it has itself put them in, in the first place, a condition that it now wants to exacerbate by choosing to cut aid. The long and short of it is that for Palestinians, at this time in their history, there is no magic bullet and no saviour in sight to rescue them from their suffering. Thank you fellows at the White House. Hope you all are getting a cheap thrill out of this spectacle.